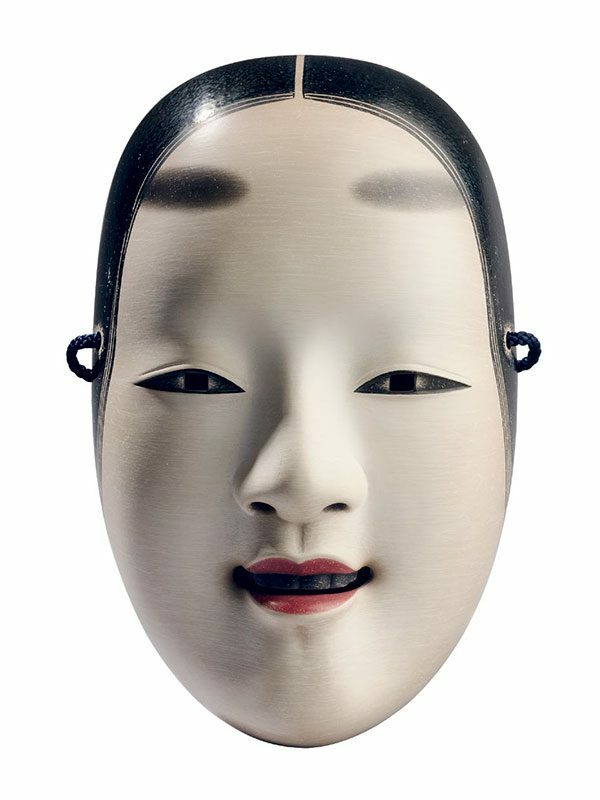 A life-like Noh Mask of a woman in wood, with painted details. The back engraved: Nogawa Yozan. With the original wood tomobako, inscribed: Nomen. Magojiro. Nidaime. Nogawa Yozan saku and the seal: Nogawa Yozan no in Noh Mask. Magojiro type (a young beautiful female role). Made by Nogawa Yozan II. Seal: The seals of Nogawa and Yozan. Nogawa Yozan II comes from the Nogawa family, a long line of Noh mask makers, based in Sendai City, the capital of Miyago Prefecture. His grandfather Nogawa Hokuzan I, also known as Nogawa Otoji, (1869-1928) made puppets, dolls, masks and sculpture in wood. He was a man of culture, versed in haikai poetry (haiku) and he set up the poetry group Hokuyosha. His father Nogawa Yozan I, also known as Nogawa Tokutaro (1900 – 1964), excelled in haikai poetry, calligraphy and painting, Noh dance and Noh song and worked in the family tradition of producing Noh masks. Nogawa Yozan II, also known as Nogawa Masahiro, was born in 1943 (Showa 18). He started learning from his father at the tender age of six, which is a traditional age to start learning under one’s father in Japanese artistic worlds like Kabuki or Noh. He became a fully- fledged independent artist by the age of eighteen. His mother Hanayo was cultivated and learned in the worlds of Kabuki and Noh. Yozan II and his mother worked together and continued to preserve the family tradition in Noh mask making after the death of Yozan I in 1964. His son, Nogawa Hokuzan II, also known as Nogawa Tomotaka, was born in 1977. He continues the family tradition.